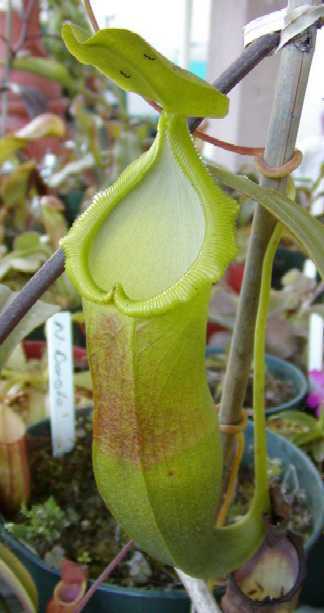 Nepenthes bongso is very closely related to Nepenthes carunculata. From the literature that I've read, some people think they are the same plant so there appears to be confusion surrounding this species. Some vendors have told me that this species and N. carunculata are synonymous with each other and that there is much variability within the species. Other vendors have said that there is a difference and that N. bongso is separate from N. carunculata. Exotica Plants lists their N. carunculata var. robusta as a different plant from N. bongso so that when they do their crosses, you know the exact parentage of the hybrids. I bought one plant from the CP Jungle under the N. bongso name and another from the Nepenthes Nursery as well. 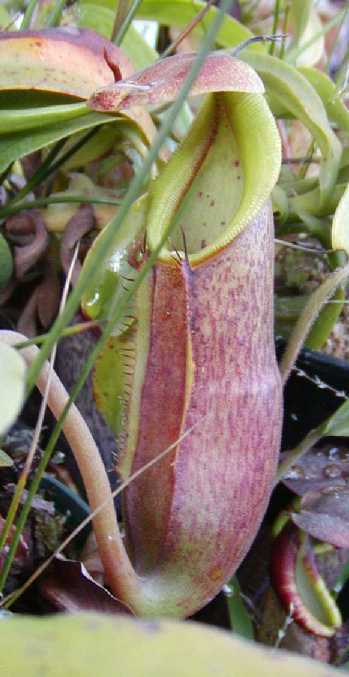 Generally speaking, Nepenthes bongso produces lower pitchers with wide, flaring maroon peristomes and upper pitchers that are more cylindrical and are greenish with orange and red streaked peristomes. Charles Clarke's book Nepenthes of Sumatra and Peninsular Malaysia has some good photos of this plant in it. My plant I purchased from the CP Jungle that I believe originated from Exotica Plants has produced two kinds of pitchers for me: the yellow green uppers and the maroon lowers. My other N. bongso from the Nepenthes Nursery is starting to grow and put out larger pitchers. I purchased this plant because the Nepenthes Nursery states that this is the "real" N. bongso. I'm growing this clone to see if there is indeed a difference between my other N. bongso and N. carunculata. So far it looks similar to my N. carunculata in regards to leaf structure and pitcher shape but it's still too early to tell what this plant will ultimately turn into as an adult. I received an email from Sumatraflora.com that said my N. bongso (not the Wistuba clone) is indeed the real thing. He said that "the name actually comes from a local Sumatran story about a princess named Putri (princess) Bongsu." So it was a treat to hear from those folks about my plant. This species is easy to grow and quite stunning from the photos I've seen in books. Species variability: none that I'm aware of when sold as N. bongso. I've seen variation under the N. carunculata species name.